Often considered to be the most popular group of films every made by MGM, the Andy Hardy series (sixteen films spanning 10 years) starred Mickey Rooney as the lad with a never-ending series of romantic escapades from which his father Judge Hardy (initially Lionel Barrymore; later Lewis Stone) - wise, understanding and kind long before the arrival of Mr. Cleaver in Leave It to Beaver - rescued him. 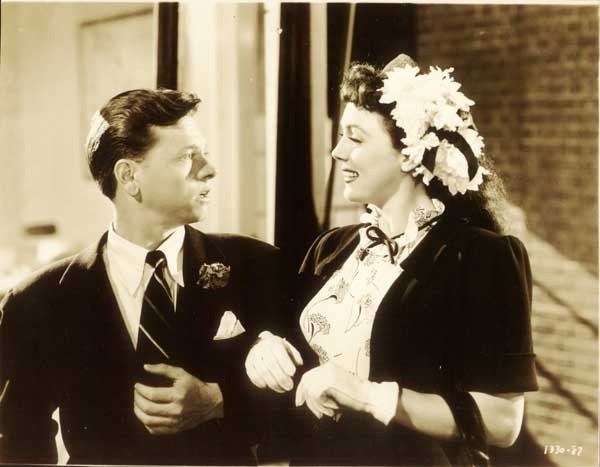 Directed by Willis Goldbeck in 1946, Love Laughs at Andy Hardy was the final film of the series (save a reunion film made in 1953). What is striking in these films is the pure simplicity of a way of life in America long since gone. In this romp, Andy's heart is severely wounded when his girlfriend Kay Wilson (Bonita Granville) announces she is marrying her guardian. As the head of Wainright College's Ball, Andy must find another date and is hooked up with the very tall, Coffy Smith (Dorothy Ford). You can imagine the comedy of highs and lows that ensues. While formulamatic to its core, Love Laughs at Andy Hardy still resonates 60 years on in its representation of the pain unrequited love can wield and the lengths young men will go to regain their footing when snubbed. My rating 8 out of 10.